This small group tour of 17 guests or less gives you the chance to have a more personable experience when visiting two of the UK’s top locations – Oxford, Stratford-upon-Avon and a drive through the Cotswolds. Led by an expert guide, you’ll get to ask as many questions as you like as you learn and discover more about British culture and history. Known for being home to the oldest university in the English speaking world, Oxford is an enchanting maze of cobbled streets interspersed with historic squares. You will enjoy a guided walking tour of Oxford to see some magnificent architecture and renowned buildings. A highlight of the tour is a 30 minute guided tour of the Bodleian Library, the main research library of the University of Oxford. It’s one of the oldest libraries in Europe and is the second largest in Britain with over 13 million printed copies inside! Built in the 17th century, this beautiful library has some of the most exquisite architecture in the city to admire and a whole host of history to learn. Ask your guide how this library came to be one of the most famous in the world and learn what its previous uses were (including an Oxford University Printing Press!) Another extra special highlight is a tour of the world-famous Christ Church College with its exquisite chapel and breathtaking sights. 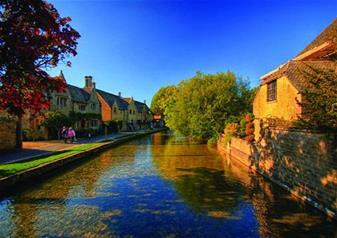 From Oxford, the tour will drive through the lovely Cotswolds countryside. Rolling green hills with a smattering of sleepy villages make up this treasured rural area. After your morning of exploration, you’ll get to enjoy a scrumptious 2-course lunch at one of the glorious quintessentially British restaurants. Arriving in William Shakespeare’s hometown of Stratford-upon-Avon, you will be able to visit the half-timbered house where the brilliant playwright was born! The legendary Bard will be brought to life as you take a step back through history in Shakespeare’s Birthplace and this charming town.